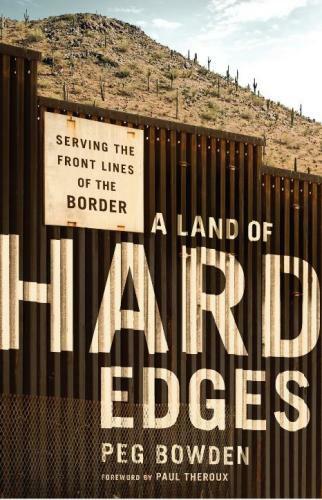 Home > Border Report > Peg Bowden’s book, A Land of Hard Edges, is released. It’s a must read. For two months I have struggled with what to write on this blog. I kept waiting for the world to look better. I needed some light in what seemed like a perpetual storm of blackness. It started with the Central American children coming by the thousands to the US border asking for shelter and refuge. So we built holding centers that looked like cages in order to house them while we figured out what to do. Many of these little ones are being deported back to their home country as I write this. We are scolding them for making a harrowing 2000 mile trip on a train known as “The Beast,” and then returning them to the hell they are fleeing. Then there was an assault on a shelter for Central American migrants in Nogales, Sonora, by masked gunmen wearing police uniforms. At 11 PM in mid-summer, the migrants were awakened from their beds, their cell phones and money were stolen at gunpoint, and they were stripped of their clothes. They were forced to lie on the floor face down. Six children were terrorized by the police with guns raised to their faces. 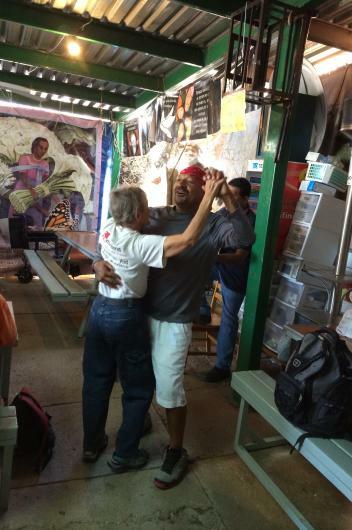 The assault is under investigation, and the Kino Border Initiative is pushing for answers. The drama in Ferguson, Missouri, continues today, with the police wielding weapons more suited for war than peace-keeping. An unarmed African American teenager was shot by a white police officer in a black community, and tensions are high. There is rioting and protest demonstrations on the streets of Ferguson. The photos look like we are back in 1967 again. Gaza extremists and Israel continue to communicate with rockets and gunfire. Thousands are dead and wounded. Neither are ready to talk. Madness reigns. The US journalist, James Foley, missing almost two years, was recently beheaded in Syria by the Islamic State (ISIS) adding to the carnage that is on every front page in the country. Killing journalists who are printing the truth of what they see is not new. This has been happening in Mexico for years. A special prosecutor in Mexico admits to 67 journalist deaths since 2006. And then there was the tragic suicide of Robin Williams, which has nothing to do with the political and humanitarian events of the planet. But it just hit me in the gut. I loved the guy, and marveled at his speed and irreverence and kindness and complexity. He was a whirling dervish onstage, and left me breathless with laughter. World events are definitely out of my control. I cannot read about it anymore. Maybe this is what burnout feels like—that feeling of being pummeled by hot ash from some volcano in my own backyard. 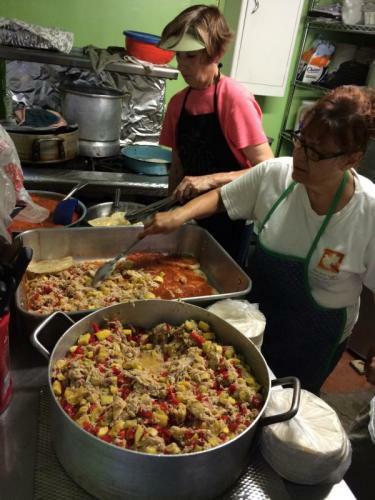 There is something to be said about walking every Tuesday to the comedor in Nogales and serving up the kitchen miracles of chef Lupita to a roomful of hungry migrants. 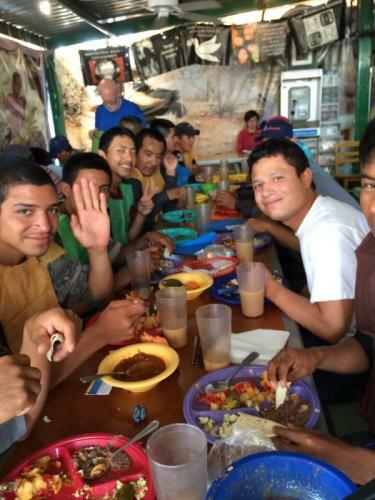 The food is good, the smells are intoxicating, and the migrants are appreciative. The Samaritans are doing something concrete and useful. Eat, drink, pray, and dance. Today there is dance, and a man from Hawaii with a bright red kerchief on his head does a fancy 2-step with Samaritan Shura. 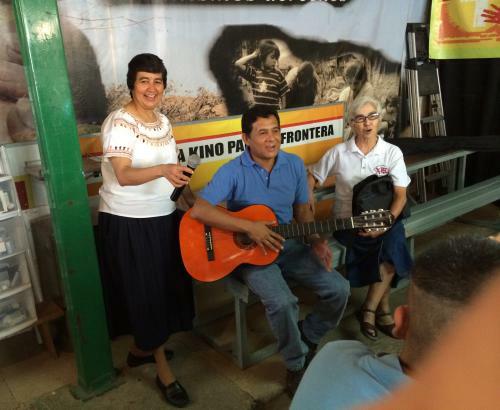 Padre Samuel strums his guitar and the room is alive with song and clapping. The man from Hawaii has lived on the islands for 16 years, was picked up for a minor violation, and deported. 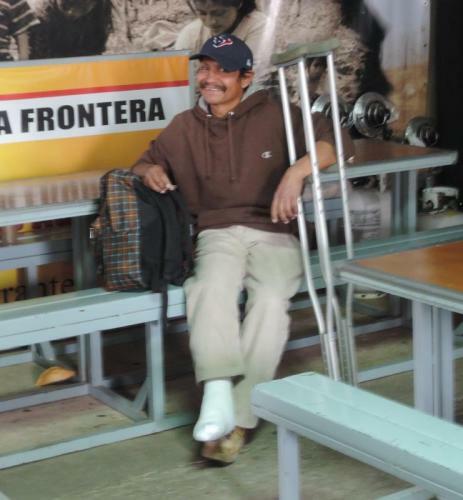 He will return to his home in Mexico for now and figure out what is next for him. 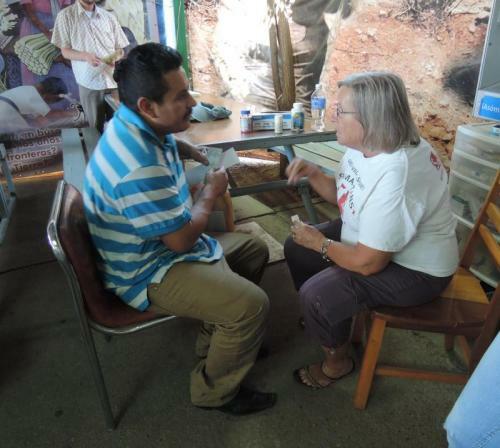 Many of the pilgrims this week are from Central America. They will either stay in Nogales or attempt to cross into the US to find their families. There are children and babies and mothers and fathers and teenagers looking for a better life than the one they have left in Honduras, Guatemala and El Salvador. They are scared, hopeful and determined. The children need a bath. I want to brush their tangled hair. I want to take them home with me. They are adorable as they squeal and chase the resident cat around the tables and chairs. Everyone’s spirits are lifted when the toddlers are running about. I’m also pleased to announce that my book is in the marketplace, at last. The book, A Land of Hard Edges, is available on Amazon.com and Barnesandnoble.com. 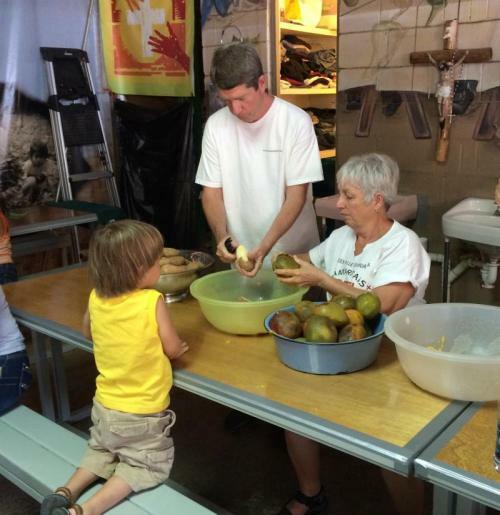 It is the story of my experiences at el comedor over a one year period—my reflections on the power of love and family that drives people into the treacherous landscapes of southern Arizona. So I’ll keep walking the mile to el comedor each Tuesday with my Samaritan colleagues. We will pass out the breakfast, tend to the blistered feet of the pilgrims, and listen to their stories. I think the secret to a life of fulfillment is just putting one foot in front of the other. Just keep moving. No matter how crappy you feel. Do something you believe in, and your life will matter. Locally in Arizona I will be doing some book readings and signings. On Sept. 13, at 2 PM, I will be at the Tubac Presidio in Tubac, AZ. On Nov. 14 I will be at Antigone’s Bookstore in Tucson at 7 PM. On Nov. 16 I will be at Hozhoni’s Bookstore in Tubac, AZ. at 1 PM. Bloomsbury Bookstore in Ashland, Oregon, will host a signing and reading on Sept. 23 at 7 PM. If you wish to receive regular postings (usually once/month) to this blog, register in the Announcement List space in the right-hand column, and you are automatically on the email blog list.